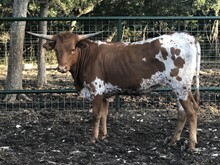 Nice flat twist horn cow. Her dam goes back to Overwhelmer on the sire and dam side. Her dam has twist horns and her 2-year-old heifer is already starting to twist. She will add twist to your program.